Azure's DocumentDB allows something nowadays that is not trivial with e.g. Azure SQL Database. It allows us to create a global database, all with one connection string. 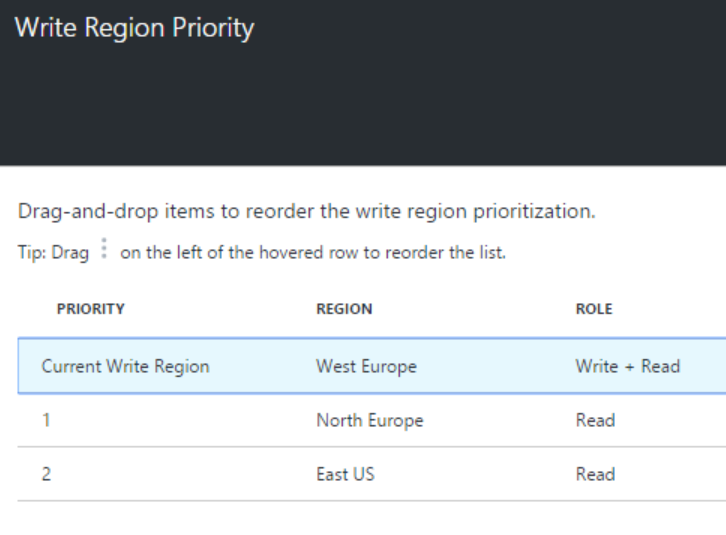 With Azure SQL it is also not difficult to create a geo-replicated database, but you have to use different connection strings and manage fail-over yourself. 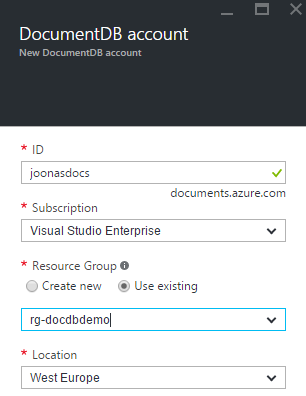 To get started, you have to create a Document DB - Multi-Region Database Account. 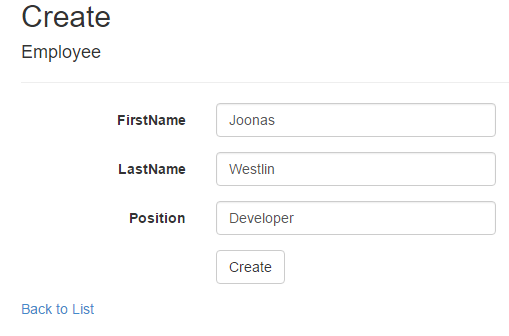 After creating the account, you can add more regions very easily. Strong: Reads always see the most recent write. Only works for single-region! Session: A connected session will see its own writes. Offers good performance. Eventual: Changes are seen "eventually". Highest performance option. For a global DocumentDB, Strong is not an option. Most applications would probably choose Bounded staleness or Session. Choose Bounded Staleness if you want a stronger consistency. Otherwise, use Session. This is another thing you can set on the database. It defines which region is the writable primary. Try to choose the region where you get the most traffic. For this demo, I set the consistency to Session. 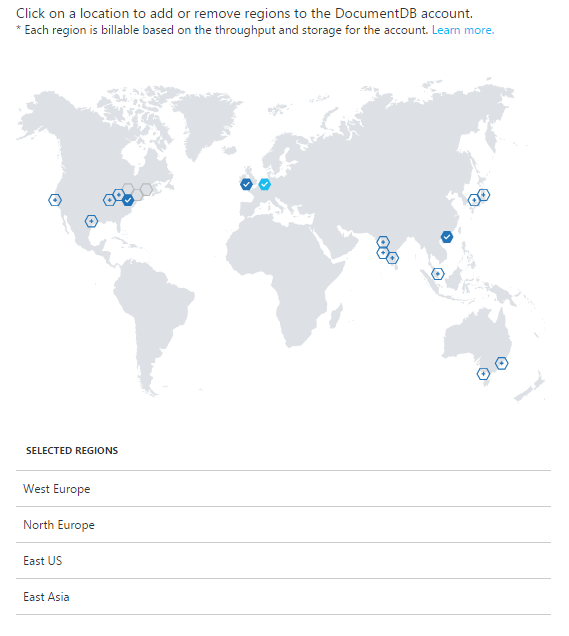 I also deployed the DocumentDB to North Europe and East US in addition to West Europe. I then created an ASP.NET MVC application in Visual Studio that allow me to write and read documents. First you must install the NuGet package Microsoft.Azure.DocumentDB. Note the function to cast a Document to an Employee. Someone on Stackoverflow mentioned I should be able to just have Employee inherit from Document, and that would work. It however did not. The other option was to define this. Then, a utility class for ensuring the database and necessary collections exist. This is run from Global.asax.cs on start-up. I published the app to North EU, West EU, and East US data centers. I then created some employees, updated and deleted them. Session: Everything works perfectly, actually updates were immediately visible in all regions. Bounded Staleness: Everything worked perfectly, but I guess it could break with enough load. Eventual: Things started breaking, it would no longer find the entities it just created. In the case of an app like this, Session consistency works best. Since otherwise the employee the user just created might not be visible after creating it otherwise. If your app can live with lower consistency, then choose one of the other ones. Now my app was not designed to handle eventual consistency, which lead to it not working. But you should remember it is possible to set the required consistency on a request-basis. Now it just used the default consistency I defined in the portal since I did not specify otherwise. Honestly setting this up was a bit too easy. I'm seriously considering using DocumentDB in future projects. I can't run it on my dev box. We have to create one for each developer working on the project. Collection maximum size is 10 GB which can be enough for a lot of apps, but it can cause problems. Why is there no ReadDocumentAsync<T> function on the DocumentClient? Now I have to either first cast to dynamic and then to my type, or implement the explicit cast operator that you see above. This typed function could just call JsonConvert.DeserializeObject<T>() right? You can find the official documentation for multi-region DocumentDBs here.